The days leading up to our departure for Barbados were not easy. The beginning stages of IVF are brutal and I don’t think that you can really prepare for it. We started the medications on Friday, February 2nd, and my period was one with a vengeance which I assumed was from the birth control something I had experienced in my past. I went to work that morning after my first Clexane injection in the tummy, which was not too bad after icing the area prior. 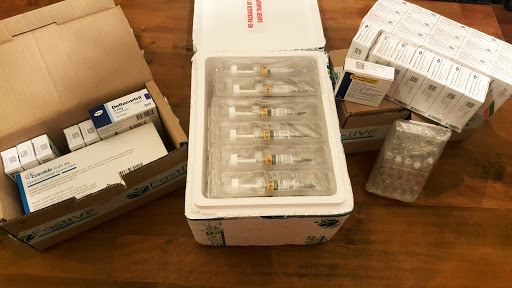 My husband is my shot master and a big shout out to him because I did not have to mix up the first shot or worry about looking at the needles. He took that part on for me completely. He was my rock through it all! The pain had gotten so bad that I ended up leaving work around 11am. In addition to the pain I began to feel overwhelmed and knew that I just needed that time to myself and to rest. It was so important to make sure I was taking care of myself and above all else that I was in a good mind set, so I went home. Later that evening as I began feeling better after some ibuprofen and a much needed nap it was time for our Menopur and Fostimon shots. The shots as much as they burn and how painful they can be were not only causing me physical pain, but emotional. They were symbolic. A symbol that had not hit me until it was happening; that this is where we are and this is what it is going to take. When you first start taking the meds you see the countless number of shots, vials, etc and it seems like it is endless. We were doing two shots that night one each, we later found out we could mix them thank goodness, so only one shot (Thank you ANNA at BFC)! That first Menopur shot, however, burned like nothing I have felt before, and I yelled at CJ to just “get it out, get it out” luckily he did not listen to me and did what needed to be done. After he took the shot out I sat there and I cried. I questioned if I was strong enough, I questioned if the process would work and the hardest part was that I could not explain my feelings. When I tried the only words I could manage to share were “this is hard”. I knew that going in, but to do it and to start it that first day it was simply that, it was hard. I found myself a normally very independent person, very dependent especially on my husband for those beginning stages of the process. I just wanted to be with him all the time, I felt better when I was with him and I needed all the love and support I was getting from our family and friends. So, if any advice please do not start this venture alone, you need support, you need people to confide in and hold you up in those hard times. I was truly so thankful that we were able to look forward to going to Barbados and able to leave day to day activities behind so we could focus on IVF, the process and just be together. The medicine did get easier, I think we hit a nerve that first day because I bruised instantly. The pain was pretty consistent each day and the Clexane injections burned as well, but it got easier. CJ learned not to do the 3, 2, 1 countdown before each shot, that made me a different kind of crazy. I learned to squeeze his arm or leg during the pain and stop acting tough...there was no need. We listened to different songs while we did the shots at night to prepare myself and provide a distraction.